There's more than 1,500,000,000 square feet of street space in New York City. 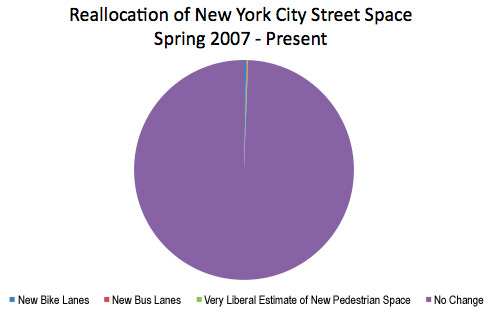 According to Streetsblog's rough estimates, using generous assumptions for the square footage of recent street changes, less than one half of one percent of NYC's street network has been allocated to bikes, buses, and pedestrians under Janette Sadik-Khan. “The city’s war on automobiles has just gone aerial,” screamed the New York Post in a recent story about speed cameras. A Daily News op-ed in support of safety improvements proclaimed “the battle against cars has saved lives.” The Times matter-of-factly declared last month that “New York City has gone out of its way in recent years to cater to the nonmotorized.” No matter where you get your news, you’d be forgiven for thinking that the last three and a half years have been a time of revolutionary frenzy on the city’s streets. While the DOT under Janette Sadik-Khan has made incredibly important steps to improve safety and mobility for New Yorkers, the truth is that the overwhelming majority of New York City’s streets remain about the same. We did some back-of-the-envelope math to estimate just how much street space has been reallocated from drivers to pedestrians, cyclists and transit riders in recent years. The answer: not a whole lot. In fact, we estimate that less than one half of one percent of NYC’s street space has changed in the past three and a half years. To crunch the numbers, let’s start with the most headline-grabbing change to NYC streets: bike lanes. Between the summer of 2007, when Sadik-Khan took over at DOT, and the summer of 2010, DOT installed 14.8 lane-miles of separated bike lanes and 130.9 miles of painted bike lanes (we chose to ignore sharrows, which don’t reallocate any space away from drivers) [PDF]. Assuming that separated bike lanes are eleven feet across, the width of the Prospect Park West bike lane and the Columbus Avenue bike lane, including buffer zone [PDF], that comes out to about 860,000 square feet of this most contentious kind of bike lane. For on-street lanes, we generously assumed that each is six feet wide and assigned a three foot buffer to 20 percent of the lane-miles. That totals around 4,562,000 square feet of area. In terms of new bus lanes, we counted around 15.5 miles — along 34th Street, First and Second Avenue, Fordham Road, and Livingston Street (there are also some smaller projects like two blocks at the approach to the Triborough Bridge). With 12-foot lanes in each direction [PDF], DOT has built around 1,964,000 square feet of new bus space. Both the bus and bike estimates probably overstate the amount of street space taken away from cars. They include, for example, all the space in line with a bus or bike lane that spans an intersection — space which is shared with crossing motor vehicles. Measuring the amount of new pedestrian space created is a trickier matter. Pedestrian space is part of all kinds of projects, from bus bulbs and bike lanes to Safe Streets for Seniors improvements and public plazas. It’s difficult to compile the precise figure, and DOT didn’t provide us with a total amount of new pedestrian space created over the last three and a half years. But we can provide a few numbers for context. DOT’s highest-profile project, Green Light for Midtown, built 65,000 square feet of new pedestrian space, according to DOT’s 2009 progress report. The entire first phase of DOT’s plaza program, which hasn’t been built yet, will create 92,000 square feet of new pedestrian space. DOT has built new pedestrian space in dozens of smaller projects as well, like the 3,000 square feet of refuge islands and sidewalk extensions it constructed to improve access to Harlem River Park. It’s hard to imagine that the total amount of pedestrian space created could total more than 2,000,000 square feet. In contrast, the city’s stormwater management plan [PDF] reports that there are 35,933 acres — or 1,565,241,480 square feet — of street space across New York City (more than double the total sidewalk space, interestingly). In other words, the total amount of street space taken from cars and given to bikes, buses, and pedestrians under Janette Sadik-Khan equals less than one half of one percent of the city’s total network. And that’s with the generous assumption that on-street bike lanes and bus lanes aren’t constantly encroached upon by motor vehicles. Just as DOT has spent more adjusting its pothole budget for the worse-than-usual winter weather than it has on three years of its bike program, nearly all of the street network remains unchanged over the last three years. For better or for worse, the “war on cars” exists in the conflict-hungry minds of the media, not on the streets of New York. DOT didn’t provide us with a total amount of new pedestrian space created over the last three and a half years. Don’t worry. You can always hire Jim Walden to sue the DOT for this information. I suspect that citywide, autos have increased their space at the expense of pedestrians more than pedestrians have gained in new plazas. Good stuff. Can you write an Op-Ed in the Times? This is a really great article. I suspected the amount of street space turned over to bicycles in the last few years was at best a few percent. This just drives home how astonishingly small it really is. That is the past three years. Then look at the previous 100. How might the reallocation of street space to bicycles, pedestrians and restricted bus lanes in the recent years compare with the reallocation of streetcar lanes to motor vehicle lanes after WWII? (Before mass auto ownership, the streetcar rights of way were often not paved). To the reallocation of park space to highways in the highway building era (although parkland was added at the same time)? To the reallocation of pedestrian space on sidewalks to joint pedestrain/motor vehicle space due to curb cuts? Don’t forget the tearing down of the Els, whose footings were considered a hazard for motor vehicles. What an amazingly positive benefit from such a tiny recalibration of public space. Imagine if a whopping 1% of NYC street space was taken from the car. This is a good point, but a big reason that newspaper are screaming is that much of the street space that has been changed is in very high visibility locations. Broadway in Midtown runs through the very heart of the CBD, as does 34th Street. Millions of people from throughout the city, region, country, and world travel on these streets every day, making them all the more contentious, since each group has a claim to that space. Given this, I think that any changes to such high visibility streets would garner a hostile reaction from some corner. This is part of the process of change. How much power you give to a small group of editors and local groups regarding projects that affect the region is a tricky decision. In an area where space is as tight as Manhattan, someone is always going to lose out when changes are made. The question then becomes, how much benefit does this project bring versus the political capital you have to pay to implement it? Very good point. Let’s not forget that in the early 1900s pedestrians and cyclists could could freely roam the streets. Cars drove pedestrians onto the sidewalks and bicycles off the streets entirely. Remember all the street space that was once used for stickball? Now ALL of it is solely dedicated to driving and parking. If this is a war on the car, then the past 100 years was a genocide of the pedestrian and cyclist. “The city’s war on automobiles has just gone aerial”: so, does this mean they’re going to ban flying cars, the bastards? Pedestrians faced the challenge of crossing uneven cobblestone surfaces while dodging horses, carriages, and streetcars on wide thoroughfares, with no traffic controls. Broadway was so bad they built an overpass in an attempt to improve safety for pedestrians. Cutting back the width of many sidewalks was by all means a negative development for pedestrians. Nevertheless, the introduction of signal-controlled crosswalks has made it less challenging for pedestrians to cross streets, despite the higher speed of motor vehicles. There is a lot of improvement that needs to be made. I just don’t think a fictional account of the past, which could hurt credibility, will be particularly helpful in getting us there. Don’t forget about them crazy “scorchers” — hell demons on pedal powered two wheeled contraptions — as well at the turn of the previous century. Cars are the only reason you needed signal-controlled crosswalks, and for that matter, traffic signals. Without cars, the rest of the traffic would be moving at 20 mph tops, with much of it (horse-drawn carts) not going much faster than walking speed. It’s quite easy for pedestrians to find a gap in such traffic and safely cross. I’ll also submit that if traffic is too continuous to find such a gap, then there’s just too much traffic on that particular road. It’s then incumbent upon city planners to build new roads, or divert traffic elsewhere, or if all else fails, just build a pedestrian overpass/underpass. I’ve seen how “safe” it is crossing at signalized intersections with the light. You need to look over your shoulder for turning cars while simultaneously looking for cars/bikes blowing the light. I feel 10 times safer crossing in the middle of the street. I’ll take the past(except the cobblestone streets) over the present any day. I’m sorry, but the historical record clearly does not support a mythical pedestrian nirvana. Cars move faster, but they are also much more predictable in their movements than horses. Emissions are a real health concern (and there have been significant, ongoing improvements), but there have never been outbreaks of communicable diseases spread by car waste – horses were a huge disease vector in cities. Ever seen the impact of being kicked in the head by a horse? Parked cars tend to be perfectly safe. How fast does a wagon wheel have to move to crush you? Make no mistake, there are a lot of problems with cars. The way we use them consumes too much energy, wastes valuable space, degrades our environment and quality of life. But I repeat, a fairy tale story about the past doesn’t help find real world solutions. Improving the safety and quality of life of urban streets is an ongoing effort. I often think it would be more productive to wear the mantle of progress, acknowledging that there were certain improvements with the introduction of cars, and new challenges we now must work to overcome. Those who stand in the way of improving are streets are clearly against progress. Jay: You clearly haven’t gotten the memo. The only reason there are traffic laws is to protect people from cars. That’s why humans on bikes can run red lights scot-free. It’s really all that simple. Believe me, nobody here seriously wants to return to streets full of horse manure, or getting kicked in the head by a “parked” horse. All we’re saying is the myriad of nonsense laws both pedestrians and cyclists are expected to obey mostly wouldn’t exist in the absense of motor vehicles traveling at high speeds on city streets. Why should a pedestrian wait 2 minutes for a light until they can cross the street? And on the flip side, why should cars (and especially bikes) sit still at an intersection when nothing is there? There has to be more intelligent ways of controlling conflicts than the way we’re doing it. Just slowing things down to ~20 mph maximum means most intersections can operate on a see and be seen basis. Some may still need traffic controls simply because of high traffic, but at least make those traffic controls intelligent. Why must lights turn red on regular cycles if there is no cross traffic? Can’t we install traffic detectors(and push-to-cross buttons) so they only go red on the regular cycle if something actually needs to cross(and turn green as soon as the road is clear again)? We need to do things better. What we have isn’t working well from either a safety or a keeping traffic in motion standpoint. That’s my take on how we can improve the streets. Safer=people getting used to the idea that they must look out for everyone else all the time, not be like automatons depending upon laws and traffic control devices to keep them safe. Joe R., those are lots of good, productive comments. Thanks for the post – it validates the point I am trying to make. We are more likely to get results by focusing on precisely this type of substance, rather than shouting about how cars destroyed our supposedly perfect cities. Joe R – Those are great ideas. I especially like the idea of a 20 MPH speed limit that would allow motorists to motor through vacant intersections. The challenge may be on some of the faster moving major arteries such as 4th Ave. in Bkln, or Queens Blvd. where exceptions might need to be made, but I think that in NYC the overall result might be that traffic actually moves faster. Perhaps traffic lights at 20 mph limit zones could be equipped with alternate blinking red / yellow signals for each direct at each intersection that would also serve to designate the zone. The problem with bikes and bikers is not that they do not feel the need to obey laws, but that the laws that exist are not designed for slower moving bikes. Either bikes need to have their own set of rules or we need to rethink the entire picture. Getting EVERYONE to slow down might be a good way to go. That’s essentially my vision here. You’ll need to keep some arterials at 30 mph or more, and with lights, to handle requisite volumes of motor traffic. We can still control those lights more intelligently than we do. Secondary and tertiary roads could be made 20 mph, with the blinking red on side streets and blinking yellow on the main roads. Motor traffic will naturally be attracted to the faster arterials. This in turn would leave the 20 mph zones as great bike routes, whereas now they’re not because they’re often littered with stop signs or even a good many poorly synchronized lights. And pedestrians of course will be far safer in those 20 mph zones. Funny you should mention Queens Blvd. That would definitely fall under the category of both arterial and “mess”. I used to ride there quite a bit. It was relatively pleasant and fast about 15 or 20 years ago. I could bike the 8.5 miles from my home to my friend’s taximeter shop(where I sometimes picked up work) in about 30-35 minutes. Last year I rode on it-once. It was so awful I had no desire to return. The road is in piss poor shape, it seemed like the lights were longer and more poorly synchronized than ever. And the traffic was disgusting. Not sure what can be done to improve things but I can’t see Queens Blvd being a great bike route without a major overhaul (an elevated bike lane might be a perfect fit here). Anyway, add in the pedestrians and it’s a huge disaster. I’m a fast walker, but I can barely make it across in one cycle. Yet lengthening the cycles would cause traffic to gridlock. I usually opt to cross via the 71st Avenue subway station instead. Queens Blvd might be the one place we just need to throw in the towel and build pedestrian bridges. It really can’t be made to work well for anything except motor traffic without a major redesign. Yes, I agree 100% that demonizing cars is only going to make others tone deaf to anything we say. We need to push our ideas with the thoughts that all groups will benefit. Even 20 mph zones don’t necessarily mean slower trips for motorists. When you factor in that they can mostly stay in motion, albeit only at 20 mph, you could have better trip times than driving at 30-40 mph but hitting lights. We need to educate motorists on these facts. These are all great points. It was not my intention to romanticize the past either, just to point out what has been stated about the ability to cross the street in multiple locations and the slower speed of traffic. I agree that slower speeds seem to benefit everyone, especially from a public health perspective. Also, I agree that demonizing the car is both unproductive and unnecessary. The automobile is a tool like anything else, and if used correctly can be very beneficial. However, like any tool it can also be used for negative purposes or in a poor manner and can have all sorts of unintended consequences. Guess what? Once people realize how badly cars do what they are supposed to do and much better solutions are allowed to exist, they will be history. No war necessary. Joe, perception speaks louder than reality, ask anyone in advertising. I think pedestrians, especially the disabled and elderly, will have a tough crossing without a clear right of way. Sure the cars should stop for pedestrians trying to cross, but we all know this practice is not part of the culture in this city, and even if were to become so, getting multiple lanes of traffic to stop would be difficult. Those red light that bunch up traffic also enable large gaps in traffic at crossings that are not controlled. IF removing many lights and stop signs would spread out traffic, I think it would make things tougher for pedestrians and cyclists alike. Oil prices, and the price of gasoline, of course, just took off. Depending on just how high oil prices get, how critical the declining supply, and how long it takes Canada to wise-up and install nuclear/electric power in the Tar Sands, which hold more proven oil that all the Saudi oil wells combined, Americans will suffer. Americans will by necessity convert to hybrid vehicles, then totally battery/electrics for short hauls, and they will be forced by accountancy’s figures to adopt nuclear/electric bullet train networks, which will soon grow nuclear/electricity dependent infrastructures much as we find, fully developed, up and manufacturing, oil free, in China. Oil scarcity and burgeoning competition for oil from an expanding Asia drive oil prices ever-upward. Americans have been forced out of their Oldsmobiles, Studebakers. Packards, Pontiacs, into smaller more economical four cylinder Asian designed cars. Americans will now be scewed and coerced towards Hybrid, gasoline/electric cars and fuel efficient rail travel, over airplane flights, as flying takes a lot more oil per passenger. Large engined cars and SUV’s will prove to be priced beyond the average American budget. General inflation due to higher transport costs caused by increasing fuel prices, along with Fed’s money printing schemes such as Q2 easing will force inflation even higher. The ever-shrinking, over-stretched Middle Class will be expected to foot the bill. They are not able to do so, witness the union busting tactics in Wisconsin, and Middle Class will start to erode, widening the gap between the Uber-Rich and the general proletariat in the U.S.A. Meanwhile, China outstrips the U.S.A., in growth and infrastructure development, and are starting up to thirty new nuclear/electric plants this year alone, are researching Thorium bed style reactors to the tune of billions of dollars, move ahead with additions to the nuclear/electric bullet train networks, have developed fully rechargeable battery cars, and are using them in all large cities, manage through good agricultural education to feed themselves, purchase, with Yuan, petroleum and other resources from Siberia, dominate world trade with good products far below even American production costs. The American Dollar has fallen far behind the Chinese Yuan, so far in fact, its position as currency of international trade is being threatened. American schools have rested on false laurels! They have fallen behind in the world! The President of the United States of America had to admit, American schools rank 39th world wide. Meanwhile, Mexican streets are alive with gun-fire to establish who gets to supply the American population with narcotics, illegal narcotics, Dope! Americans smoke so much dope, Colombians have developed technically advanced submarines to deliver dope to the U.S.! This is not a point of pride, Yankee Doodle, it simply denotes your rapid decline and gives reason to why turning your nation around might be impossible. As the world changes, and as oil prices rise, expect Americans to run out of oil rich countries to bully. Expect Americans to face facts and go Solar, Wind, Wave, Hydro, Tidal, Geothermal, all perpetual, or renewable if you prefer, and all domestic, home grown! expect America to suddenly allow huge nuclear/electric projects to keep its people occupied and fed. Expect America to adopt the Chinese nuclear/electric bullet train network and infrastructure system over its current rubber wheeled gasoline gobbling SUV’s and McMansions in the burbs, at the factory gates! This American system has had its day! no matter how comfortable he is, no matter how loudly he complains, no matter what wars he calls on, fact is Yankee Doodle, to remain competitive in the world, and to feed himself, will have to change! He will gratefully accept hybrids, fueled with gasoline or diesel from Canada’s Tar Sands, He will by the size of his paycheck be limited to small short hop cars and nuclear/electric bullet trains, Flying will drop off very significantly.His manufacturing will be nuclear/electric powered, possibly by Chinese Thorium bed style reactors. his wages will shrink, mostly by the forces of inflation upon him. He will be less able to contract personal debt, He will live in much more humble, closer to sustainable dwellings, and he will study harder just to keep up to Asian forces upon him. Staten Island trauma doctors are calling on the State Senate to renew and expand New York City's speed camera program. 3 Peds Hit on 9th Ave. 2 Dead. Mayor Mike: Where Are You?